Prime Minister Forever - Canada -Run for Prime Minister in the 2004 Canadian election. Target provinces and even individual ridings, criss-cross the country doing barn-storming campaigns, setup detailed platforms to outmaneuver your opponents, unleash foot soldiers to stop your opponents, run attack ads. Play one of the 4 major parties (Liberal, Conservative, NDP, Bloc). With the candidate editor you can put your picture in and run yourself. 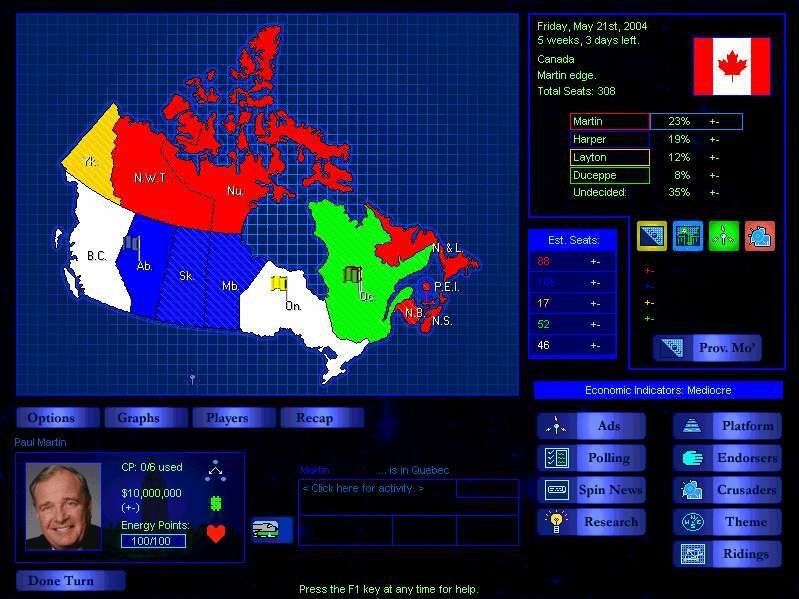 an in-depth, intense simulation of Canadian elections. *Modify candidates, or insert yourself and run for PM! *Includes any minor upgrades and customer support. Canada Free Screensaver. Photos slideshow. The fate of the nation is now in your hands. Send email from behind any firewall, no matter how restrictive it is. Qweas is providing links to Prime Minister Forever - Canada 1.0 as a courtesy, and makes no representations regarding Prime Minister Forever - Canada or any other applications or any information related thereto. Any questions, complaints or claims regarding this application Prime Minister Forever - Canada 1.0 must be directed to the appropriate software vendor. You may click the publisher link of Prime Minister Forever - Canada on the top of this page to get more details about the vendor.